In Kayla Miller’s Click, the variety show is coming up at school and outgoing Olive has not been asked to join a group. This leaves her feeling outcast and alone when she is unable to find her own “click.” Olive refuses her mom’s help to find a group, instead turning to her Aunt Molly. She decides the best choice is to become a host, the talent show announcer. In her words, “It would be a way that I could help all of my friends with their acts by introducing them” (p.132). This story was heartfelt and cute with bright colored pastel artwork which suggest that the tone is cheerful. The digital medium conveys the lively tone through expressive faces and flat simplistic backgrounds with bold highlight lines. The novel does a wonderful job touching on family relationships, specifically mother and daughter. At first, Olive’s mom oversteps her boundaries in trying to help her. By the end of the novel, a balance is achieved between allowing Olive to be independent and encouraging her to follow through. Olive also learns that, in friendships, growing apart and having different interests is okay. Her friends even encourage her in her choice to become a host. The novel has a solid plot portraying realistic issues for friendship and family. Miller shows these serious middle school themes in a lighthearted way that doesn’t take away from the tension. It’s nearly back to school time—yikes! In honor of all the teachers, librarians, parents, and oh yes, KIDS preparing for the first day of school we will be reading with that theme in mind for the first Butler Book Banter of the academic year on Thursday, September 6th. So whether you’re looking for friendship, perseverance, and heart in your stories or mean girls, homework overload, and scaredy ninjas (oh my! ), we’ve got the book for you! 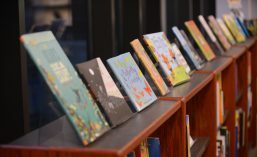 There are always a bus-load of school themed books this time of year, so if you have a new favorite that’s not on our list, bring it for show and tell. Please note, we’re making some small adjustments to planning this semester by shifting the meeting time to snacks at 6:30 p.m. and discussion from 7-8 p.m. Also, drop us an RSVP note at butler@dom.edu or comment to whichever social media post you happen to be reading. Posted in event, Henry Holt, Houghton Mifflin Harcourt, Putnam, Uncategorized.